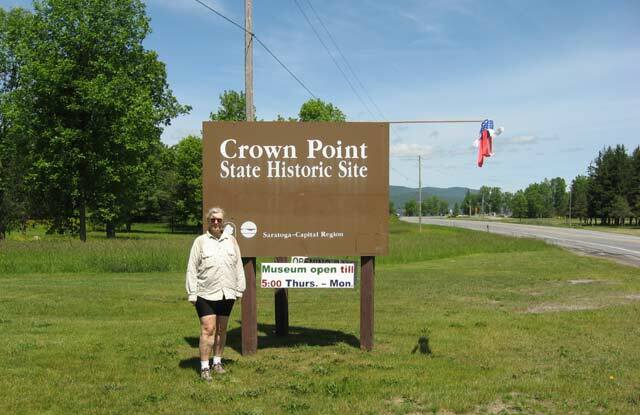 Our original plan was to travel to Crown Point and she would bike from there westward toward Rome. 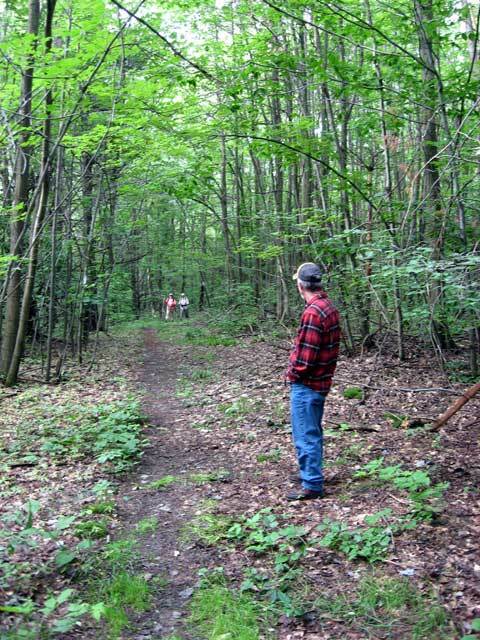 When I called to get reservations at a campground in the area, we learned that it was motorcycle week in the area and all the campgrounds were full. Having lived through Bike Week in Daytona for 14 years we passed on experiencing it again. We instead started at Rome on 6/1 and went eastward. The eastern terminus of the North Country Trail is at the Crown Point State Historic Site. She arrived here on 6/8. 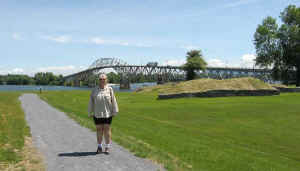 This is the location of the southern end of Lake Champlain and the bridge to Vermont. 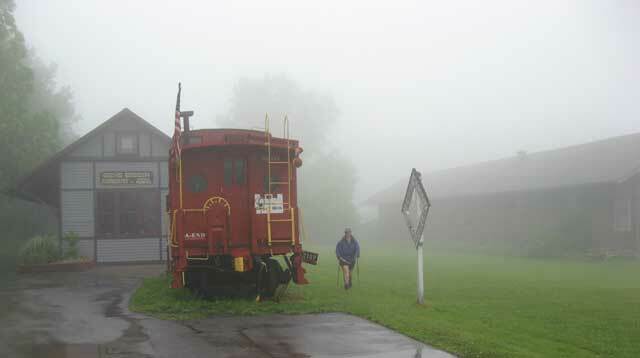 By this time the motorcycles had left and we were staying at a campground close by. 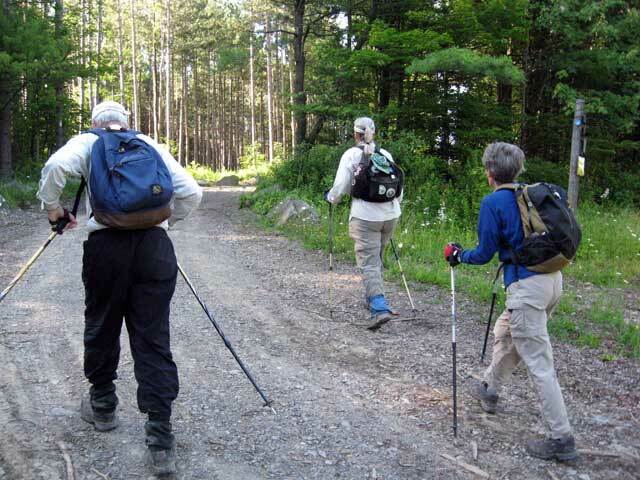 We hitched up the car and started back across Adirondack Park. 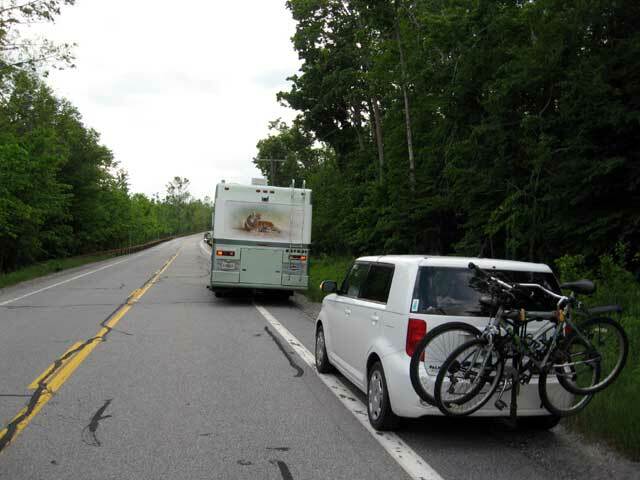 Just as we crested the top of a hill halfway across the park the engine in the motorhome quit and wouldn't start. We were stranded along the state highway and of course out of cell phone coverage. I had to unhook the car and drive a couple of mile back to the top of the hill to call road service. After spending about an hour on the phone with them, they finally figured out where we were, found a tow truck and repair facility and said help would be there in about an hour. 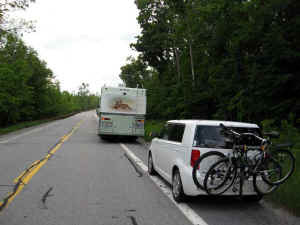 When the tow finally arrived the operator wanted to tow the motorhome by hooking up to our hitch on the rear. When I told him that the hitch was only rated for 4,000 lbs. 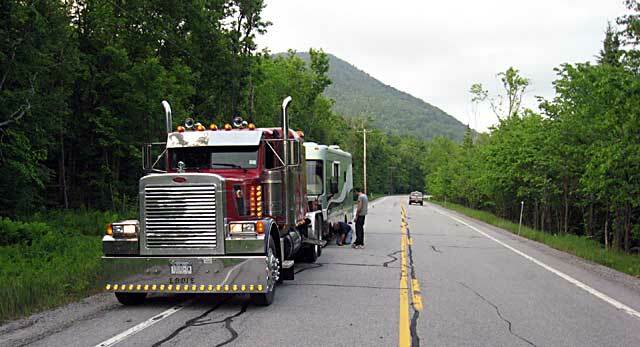 and that the motorhome weighed 16,000 lbs. he stated that he had towed 100's of them that way. I said that previously I had been towed by lifting from the front wheels and disconnecting the drive shaft. He said that he wasn't getting paid enough for that, got in his truck and left, leaving us still stranded. I think he was just lazy and didn't want to get dirty. So, it was back up the hill for another call to road service. Another couple of hours later another truck arrived from a different company. This time there were 2 guys who knew what they were doing and did a good job. We were towed 30 miles back to Lake George and since it was 8:00 on a Friday night we got to spend the night at the tow lot. They did have a 15 amp. electric hookup and let me fill the water tank. They said they would try to find someone to work on it the next day. When I said that I knew what the problem was and could fix it myself they said we could stay there as long as necessary at no charge. What a great place!!! Of course none of the parts were available locally. I had to order them online and have them overnight shipped. $1000 and 5 days later we were back on the road again with a new fuel injection pump. After a night in a local campground to recuperate and dump our tanks we finally returned to Rome. She started biking on the Erie Canal. 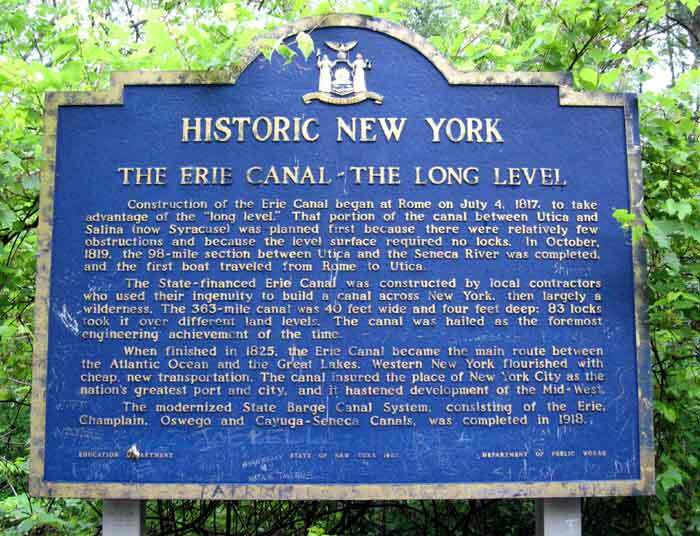 I didn't realize it but there are two Erie Canals. I must have slept through that in history class. 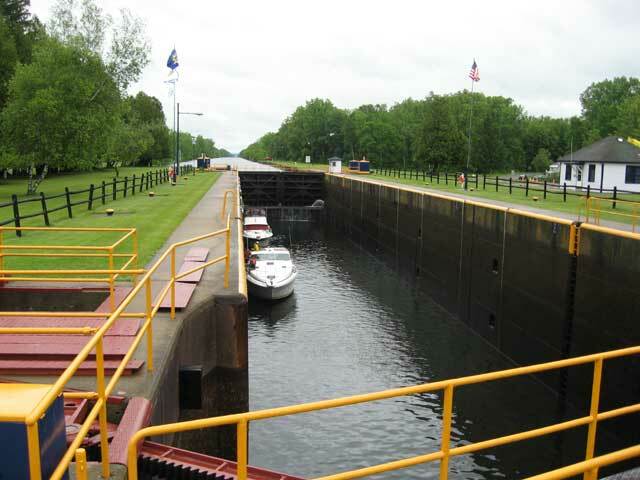 The original Erie Canal was improved and moved in the early 1900's with the advent of motorized barges rather than mule drawn. They took advantage of the lakes where the mules couldn't cross without getting their hooves wet. 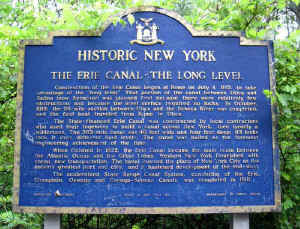 It is now the New York Barge Canal. 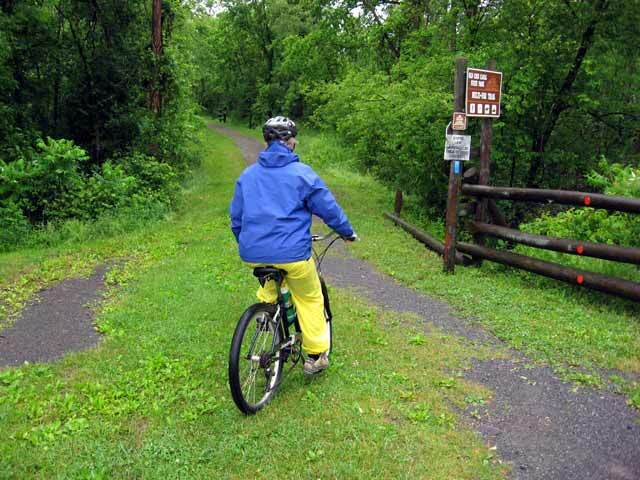 The Erie Canal trail and bike path follows the old route southwest from Rome. 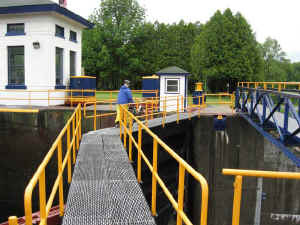 Near where the two diverge the rail crosses the new canal at one of the locks. 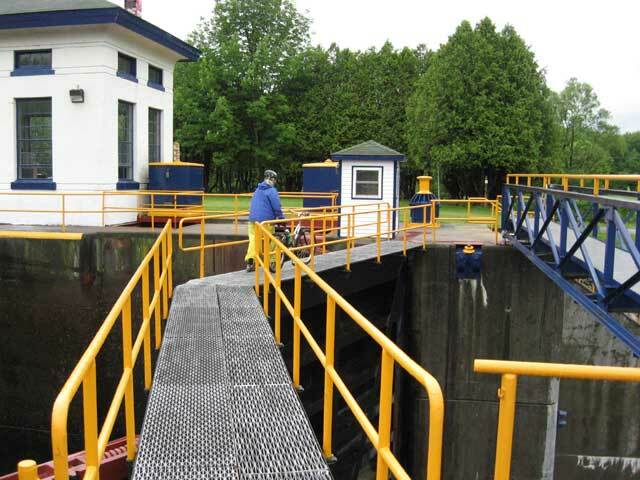 The trail actually crosses the canal atop the lock gates. She biked the section from Rome to Canastota. 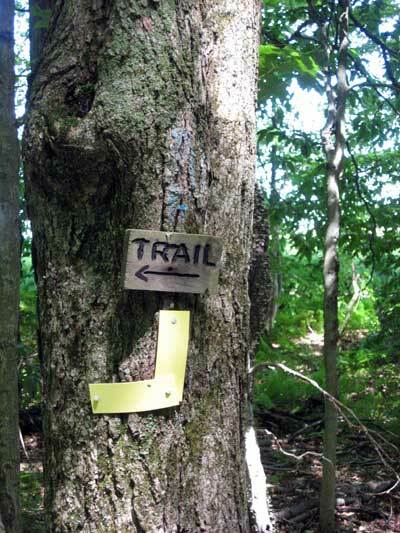 Here the route connects to the Link Trail. The Link Trail is a new connection between the Old Erie Canal State Historic Park and the Finger Lakes Trail. 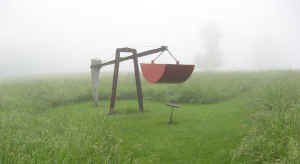 The trail goes through the Stone Quarry Hill Art Park. There are some interesting item you hike past. 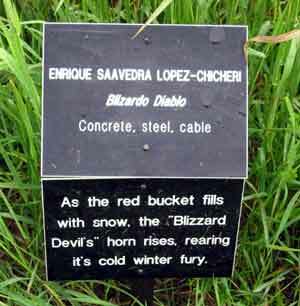 This one is called "Blizzard Devil". 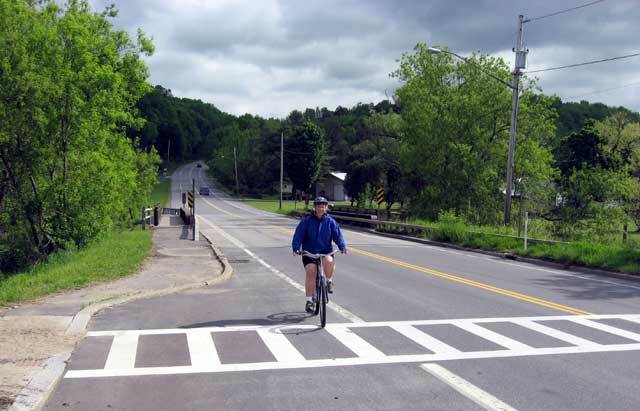 It was rather confusing at one point because there are two possible routes through this area, going directly south on the Link Trail or going west and then south on the Onondaga Trail. 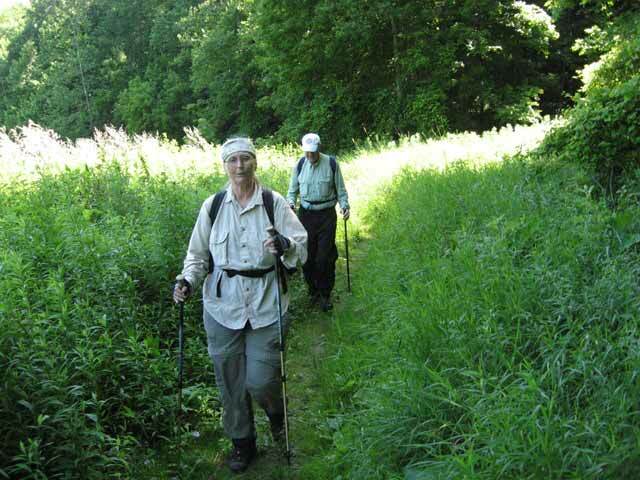 We even called the local chapter and were told to take the Link Trail all the way "it's blue blazed". 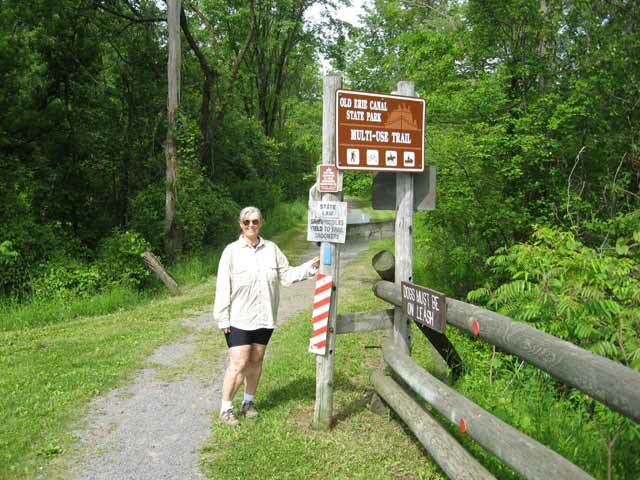 Judy reached the junction of the Onondaga Trail and followed the blue blazes which were only on the "O" trail. I was waiting at a road crossing on the Link Trail. 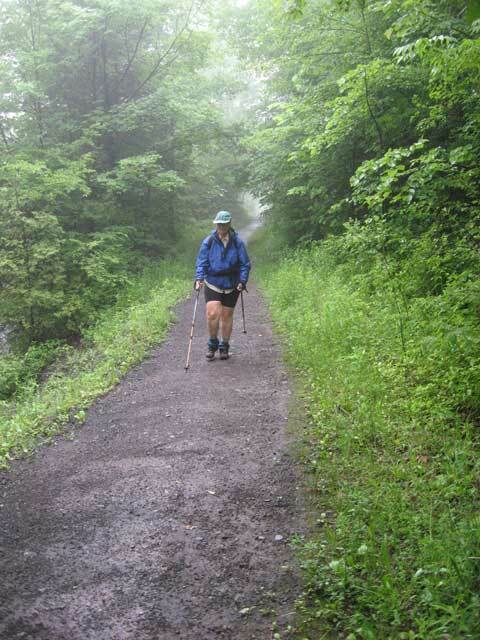 When she got to the next road I wasn't there and there were no more blue blazes. 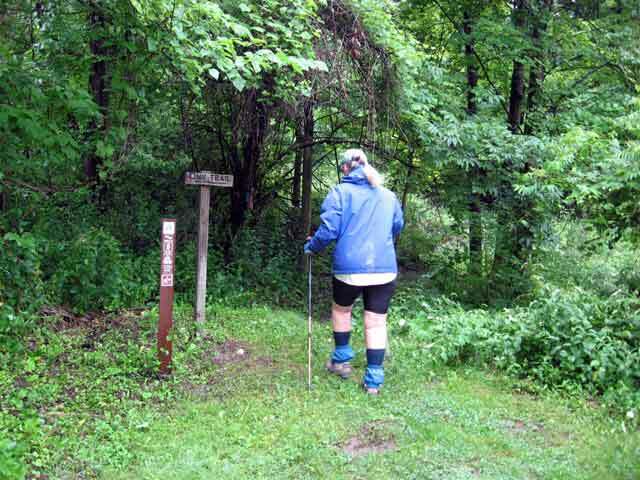 I didn't know where she was because my maps didn't have the "O" Trail on them. I decided to just drive around to see if I could find her when she called on the radio. Luckily she was within range (1 mile). 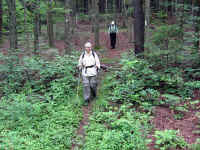 When we checked the blue blazes on the Link Trail had been there at one time but had been removed. The picture on the right shows the remains of one of them. We also found some new and interesting ways to blaze. 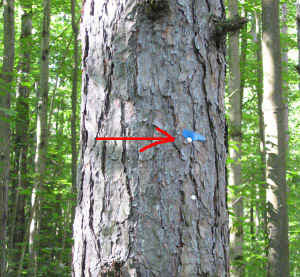 The left hand picture has the remains of a blue blaze at the top, a sign and a "new" style offset blaze at the bottom. She reached the junction of the Link and Finger Lakes Trails (FLT) on 6/23. You can see the white blazes of the FLT in the background. 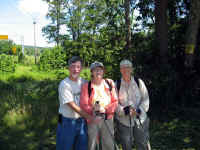 Jane and John Canfield arrived for a visit and the girls hiked together starting on 6/27. John and I were "ground support". 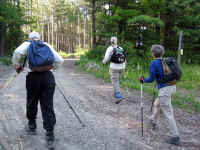 We sometimes hiked in to meet them from the pick up location but only if it was level, no up or down hills. We didn't want to overexert ourselves. 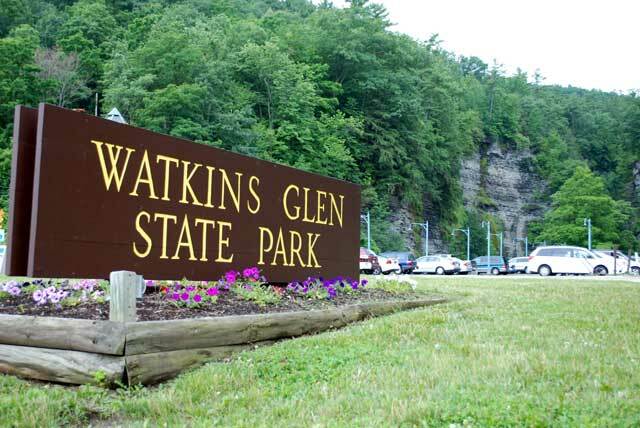 We visited Watkins Glen State Park. 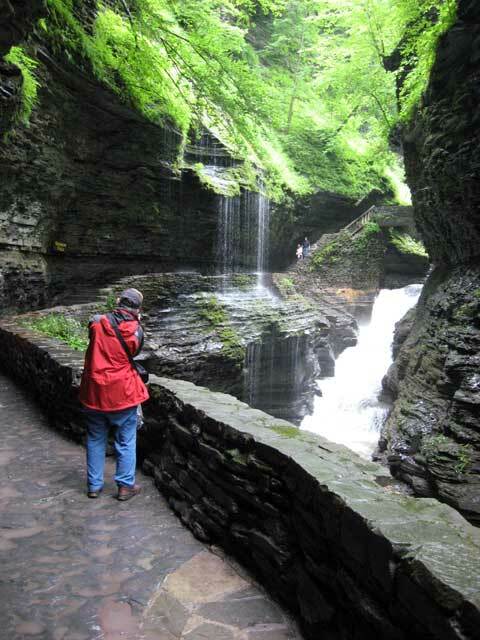 The trail thru the Glen is a "must do" for anyone in the area. We took lots of pictures. More information on the trail is available here. 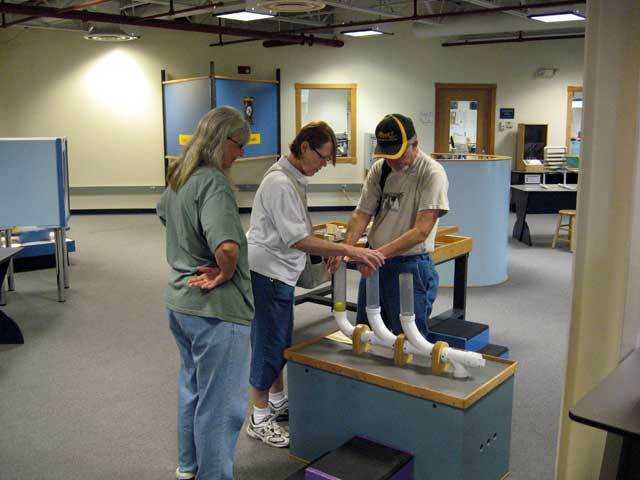 We also visited the Sciencenter in Ithaca, NY. We enjoyed playing with all the science experiments. Here Jane and John were blowing ping pong balls out of the pipes. 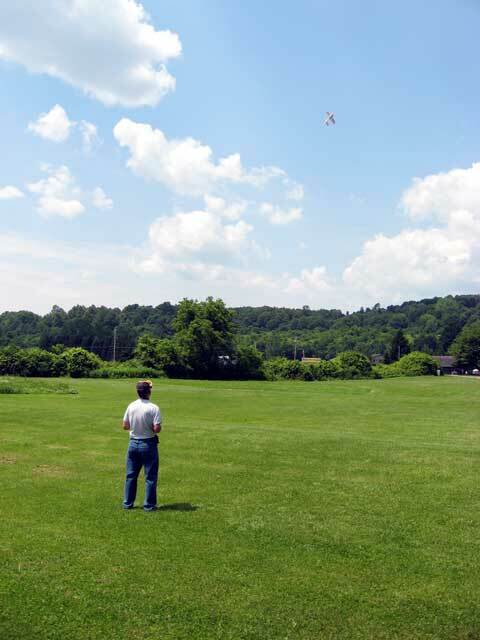 John found a nice field at one of the campgrounds where he could fly one of his radio controlled planes. John jumped into the picture to show that he was one of the hikers when the girls finished on Jane's last day of hiking (7/6). 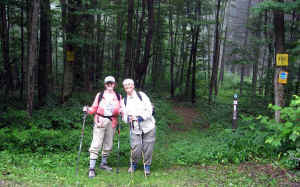 The Canfields left that day and we moved back to Cortland to pick up some sections Judy had skipped. Jerry Groebe joined us again there. We moved to Watkins Glen on 7/12 and stayed at the city campground. It's across the street from Lake Seneca. Adele and John arrived on 7/15 and the hiking group grew to three for a couple of days. The next weekend was a big wine festival in the area. The motel where Adele and John were staying wanted double or triple their normal rates so the decided to leave. 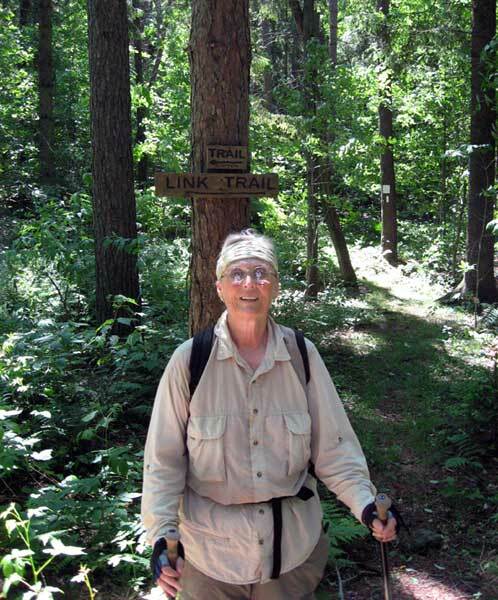 Jerry's pass from his wife expired and he had to go home so we decided to end the hiking for the summer on 7/19. 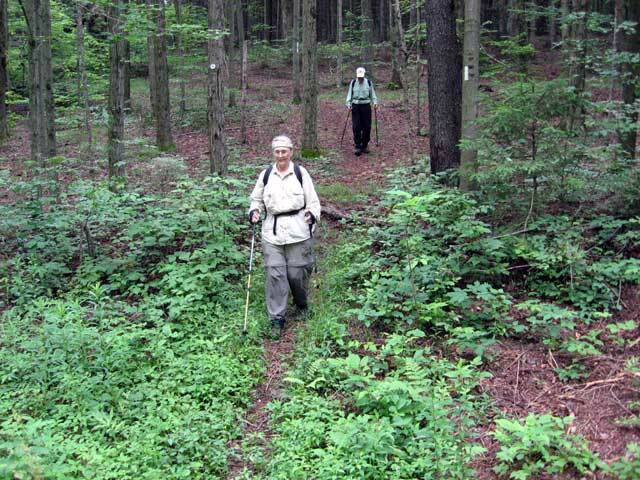 This what's left of the North Country Trail. Maybe she'll finish next year.